The team at The Armchair Selector have put together a handy guide for anyone who is wanting to watch the Ashes in 2013. It includes information about the players, the ground, some recent history and some personal accounts of ashes experiences. The layout and design of the eBook is outstanding, it's visually captivating while still being very readable. 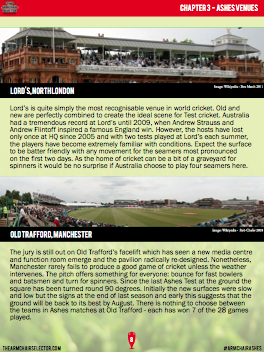 The team have done well to find a balance between being informative about the cricket, and humorous and easy to read. For me the highlight was Peter Miller's section giving tips for keeping awake through the night for the matches. The one omission was Ashton Agar from the profiles, but to be fair, he was very much a surprise selection. Overall I really enjoyed it. I would recommend it to any cricket tragic who's likely to be spending a lot of time on the couch (or to anyone who isn't a massive fan, but wants to sound knowledgeable). I'm not sure if they are planning on producing one of these for the return series, but if they are, I'll be buying one. The eBook costs US$3.99, and can be bought here.